Nidesoft DVD Converter Suite is an all-in-one pack of DVD Ripping software and video conversion tools. It can rip DVD movies and convert video files to all popular video and audio formats including: MP4, AVI, MPG, MPEG, VOB, WMV, DivX, XviD, MOV, DAT, VOB, IFO, RM, RMVB, 3GP, 3GPP, ASF, FLV, WMA, M4A, MP3, AC3, WAV, limewire and youtube etc. With this supper pack, you won't need any single-function DVD ripping software or video Converter. ...... With this supper pack, you won't need any single-function DVD ripping software or video Converter. This powerful pack supports all popular mobile players including iPod, Zune, iPhone, Apple TV, Sandisk, PSP, Xbox 360, PS3, Archos, iRiver, Creative Zen, PMP, Smart Phone, Pocket PC, PDA, Mobile Phone, MP4/MP3 Player, etc. 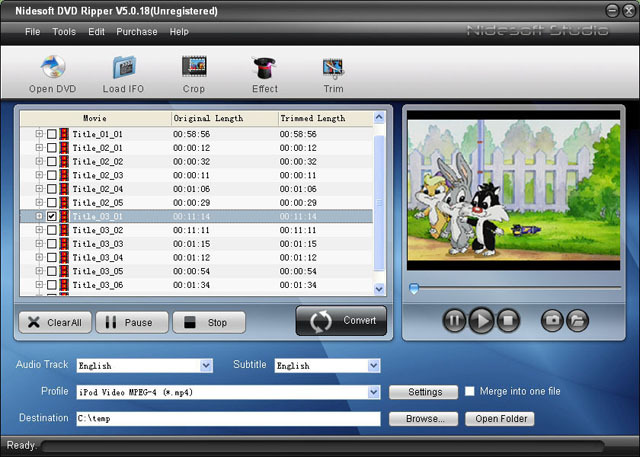 Nidesoft DVD Ripper Suite also provides powerful movie editing functions, let you trim, crop, join, and apply special to video clips easily. 1. Easily convert DVD and video to all popular video and audio formats. Rip DVD and convert video to MPEG4 ,DivX , XviD, AVI, WMV (Windows Media Player), MP4, MOV (Quick Time), RM, RMVB (Real Player), FLV(Youtube), MPG, MPEG, 3GP, 3GPP, ASF, VOB, H.264, M4V, MP3, WMA, M4A, AAC, WAV, etc. Convert DVD and all regular video files to iPod, iPhone, PSP,Youtube,etc. Qweas is providing links to Nidesoft DVD Ripper Suite 2.4.52 as a courtesy, and makes no representations regarding Nidesoft DVD Ripper Suite or any other applications or any information related thereto. Any questions, complaints or claims regarding this application Nidesoft DVD Ripper Suite 2.4.52 must be directed to the appropriate software vendor. You may click the publisher link of Nidesoft DVD Ripper Suite on the top of this page to get more details about the vendor.